DAVID ABBOTT’S SAINSBURY’S CAMPAIGN. By Richard Foster. | STUFF FROM THE LOFT. Some things are made for each other. Roast beef and Yorkshire pudding. Strawberries and cream. Parma ham and mango (see below). To this list of perfect partnerships we must add another: Sainsbury’s and Abbott Mead Vickers. It all started one afternoon in 1979 when David Abbott’s secretary put a call through to him saying there was someone from Sainsbury’s on the line. David thought it was his local Sainsbury’s, where his wife regularly shopped. It wasn’t. It was Peter Davis, the Marketing Director of Sainsbury’s, who said he had a project he thought David might be interested in and could they meet. Just the two of them. In the Putney store. The two men walked around the store (we don’t know if they had a trolley, or, if they did, who was pushing it), with Peter pointing out various products of interest and explaining to David that he wanted to do a quality press campaign for their fresh foods and own label products. He wasn’t happy with the work his agency Saatchi & Saatchi had produced, and would David like a crack at it? Peter was going on holiday for three weeks and wondered if David might be able to show him some ads on his return. He gave David a contact in the marketing department who could fill him in on product details. The ad was a naked appeal for a food account. Left to right: Peter Mead, David Abbott, Peter Mayle (part-time chairman, soon to become full-time author), Adrian Vickers and Guy Davies (the agency’s first planning director). Mayle and Davies quit the agency shortly afterwards, leaving the triumvirate A, M and V.
Sainsbury’s meanwhile had been engaged in an advertising price war with arch rivals Tesco, conducted mainly on TV through their agency Saatchi & Saatchi. It was Saatchi’s who had invented the line “Good food costs less at Sainsbury’s”, but their ads had been much more about “costs less” than “good food”. Peter Davis wanted to redress the balance with a high-profile press campaign to reinforce Sainsbury’s quality credentials. To David Abbott and his art director Ron Brown, this was manna from heaven – the chance to do a big, beautiful, colour press campaign for the bluest of blue-chip clients, with carte blanche to pick the products they thought would make the best ads. And just to put the cherry on the cake, there was no other agency involved. This wasn’t a pitch, it was a proposal of marriage. The campaign was scheduled to run in all the quality Sunday supplements and upmarket women’s magazines. David and Ron wanted to do double page spreads, in colour of course, but even with Sainsbury’s substantial budget a campaign of colour spreads would run to only a few ads a year. And David wanted to do lots of ads a year. It was AMV’s senior media buyer Paul Gummer who came up with the ingenious (his word) idea of the colour/mono spread – one page colour, for the product, the other page black and white, for the copy. The ads would have all the impact of colour spreads but at much less cost. Before putting pentel to layout pad, David and Ron spent many hours with Sainsbury’s buyers, gleaning the nuggets of product information that would form the basis of the ads. Three weeks later David met with Peter Davis again – again just the two of them – to present the fruits of his and Ron’s labours. There would have been a dozen or so concepts, with two or three pieces of body copy to establish the tone of voice. Peter must have liked what he saw because he awarded AMV the account there and then – even though David was the only person from the agency he’d met. There was only one point of discussion – Peter wanted a large Sainsbury’s logo on the ads. David had agreed to use the Good food costs less at Sainsbury’s line, but no logo. He argued that since the line included the brand name it would be superfluous – and inelegant – to also have a Sainsbury’s logo on the ads. Instead, to ensure the campaign was strongly branded, he promised to include the word Sainsbury’s in every headline. And so began one of the longest-running and most successful press campaigns in British advertising history. The ads assembled below are a selection, in approximate chronological order, from the first 10 years of the campaign. All but two were written by David and art directed by Ron, and all but a dozen or so photographed by the meticulous Martin Thompson. Looking at the campaign now, forty years on, one is struck by the sheer beauty and elegance of the work. The photography is luscious, the typography big, bold and authoritative. But it is the words themselves that separate this campaign from any other. They speak to you not as a consumer, or even a customer, but as a friend. They speak with authority, but also with warmth and wit. The headlines are intriguing, engaging, compelling. The copy, intelligent and informative, always charming, never condescending. Every ad presents a strong product story. Many incorporate a recipe. There’s usually a value message to go with the quality. And sometimes you get a history lesson into the bargain. You may have neither the time, nor the inclination, to read six hundred words about a hot cross bun. But you know that if a hot cross bun is worth six hundred words, it must be some hot cross bun. The copy becomes part of the visual. Some of the copy may seem a little quaint in today’s gigabyte world, but David’s gentle persuasion is as effortless and rewarding to read now as it was then. Gentle the persuasion may have been, but the results were startling. The mango ad increased sales from 1,000 cases a week to 10,000 cases. The ad for sparkling Saumur did even better – sales up by a factor of 14. And Sainsbury’s entire range of speciality pasta sold out within a week of the ad announcing it. Only after 5 years and 60-plus ads did David feel he could entrust his baby to another creative team. I’m proud to say John Horton and I were that team. (No pressure.) The campaign continued for many more years, with other teams, as well as David and Ron, contributing to the pot. From time to time (usually coinciding with the appointment of a new marketing director), the ads went through various different “looks” in an effort to keep the campaign “fresh”. But none of these were as pure, as powerful, or indeed as fresh as the original. Enough of my words. Time to enjoy David’s. The essence of Sainsbury’s – introducing new and sometimes unpronounceable food items to the British shopping list. A horizontal product demanded colour on both pages. The Sainsbury’s-in-the-headline rule didn’t apply if there was branding in the visual. An ad that demonstrates Sainsbury’s love of their customers – and David’s love of his wife. According to Jeremy Miles, the account director, David did this ad in the taxi on the way back from the briefing meeting. Sales of the house claret increased by 270%. The Haute Medoc by 430%. Every time I see this ad I want to eat it. Inside every copywriter there’s a toe-curling pun just itching to get out. It’s a testament to the client’s good humour that they let this one escape. I have taken the liberty of including my first Sainsbury’s ad, done with John Horton, and the first not done by David & Ron. Another Foster & Horton ad, included here purely for egotistical reasons. David’s last Sainsbury’s press ad. In his own words: “Oh, the joy of it! On the afternoon before Budget Day, the Evening Standard prints a photograph of the Chancellor of the Exchequer in Downing Street. Some of his papers are stuffed into a Sainsbury’s bag. Wonder of wonders, the slogan is clearly visible. 12 responses to DAVID ABBOTT’S SAINSBURY’S CAMPAIGN. By Richard Foster. I’d assumed it was Ron. but the line is perfection, it’s not a ‘maybe we could say this’, it’s like THE correct answer in a maths exam. I wonder if the campaign they are running now has the same effect on sales? Excellent article. Should be compulsory reading for all agency people and clients. Oh, but I forgot, apparently nobody reads anything any more. Wise words from someone who has always had a way with words. Budget Day ad. These days, would the client hesitate because plastic not environmentally friendly? Or maybe it gets killed by zealous planners? Here’s a 2019 execution of a similar brief. 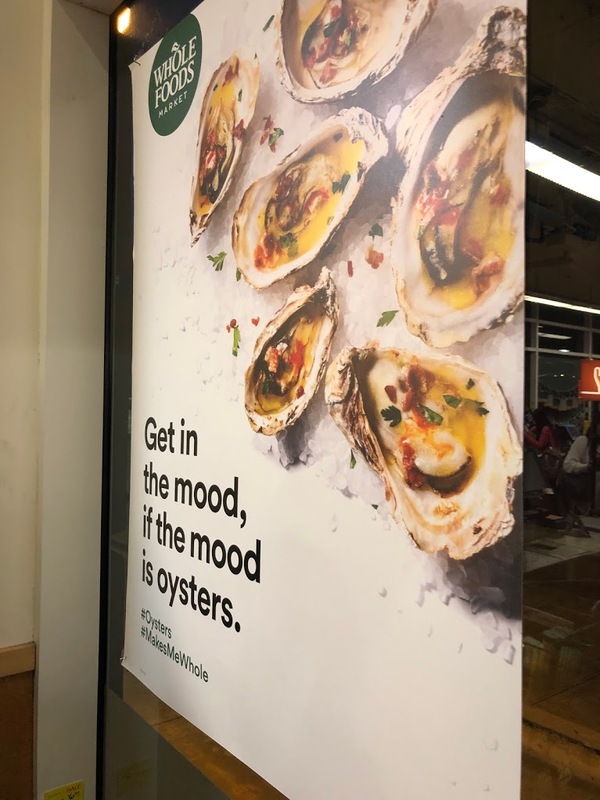 Whole Foods, San Francisco. Previous post PODCAST: Sir Frank Lowe. Next post PODCAST: Dave Hieatt.